Wicked Queen returned to the winners stall in fine fashion today at Ipswich when she took out the Schweppes Benchmark 58 Handicap over 1666 metres. The daughter of Wicked Style had put the writing on the wall two starts ago when finishing a close second but failed to handle the extremely heavy conditions at her most recent run. But back on a soft track today Wicked Queen kept her impressive track and distance record in place by scoring by a margin of just under two lengths. Winning Co Trainer Bryan Guy was a relieved man after the event explaining that he and his fellow Co Trainer son Daniel left the Ipswich track two weeks prior somewhat disappointed with the mares effort “We thought she would go much better last start but it must have been far too wet for her because nothing came to light after the race and we headed here today thinking she would race well and thankfully she did. What really helped her today was a gem of a ride for Jim Byrne, it’s not often you draw one from the outside and are fifth one off after a furlong”. 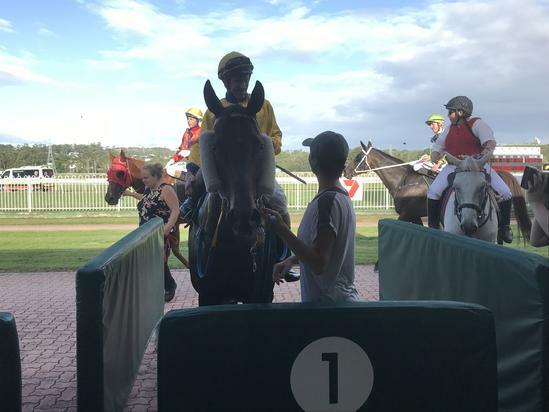 Co owner and Co Trainer Daniel Guy also praised Jim Byrne for his effort on the mare “The ride made all the difference and it was great to get the mare back in the winners stall today after what has been a stop start preparation. My fellow owners have been very patient this prep not much has gone right so hopefully all that is behind us now and we can go on and put a few together”.